In c1972, Kenneth Wells wrote a series of three books entitled "Step by Step Metalwork". These books contained detailed stepwise instructions for making several projects ranging from the simple to the sophisticated. They were intended for use in school metalwork classes and the methods described were based on the facilities available in typical school workshops. 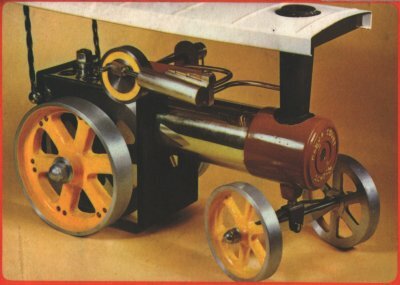 Book three of the series contained details of two live steam toys; a stationary engine and a traction engine. Most of the examples made were probably binned soon after the makers left school (or maybe before). Some, however, have survived to this day, mostly traction engines. As can be expected from who made them and where, the standard of workmanship varies tremendously. This example of the traction engine leaves something to be desired in that respect. Because of their intended purpose, many diverse techniques have been used in the making. The boiler is copper with brazed end caps and soldered steam fittings. The smokebox/chimney and the wheels are cast aluminium or mazac (I'm not sure which). 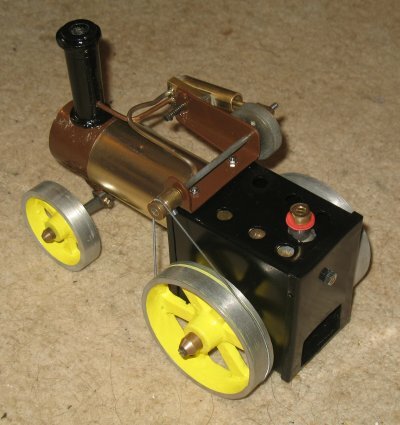 The engine components and safety valve are machined brass. The flywheel is turned steel. The engine mounting bracket, front axle mounting and firebox are bent sheet metal. 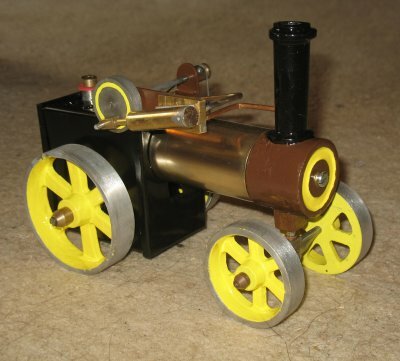 In the book description, the firebox is supposed to be partially chrome plated but this example is all painted. The boiler is 44mm diameter x 140mm long copper tube with brazed end caps. There is a brass wrap around casing to improve it's looks. 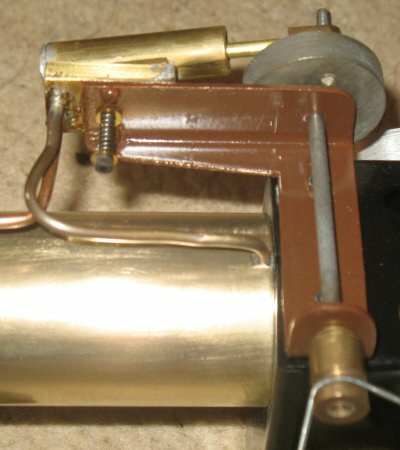 The safety valve is a simple turned brass block with a countersunk hole through it. The plunger was missing and I've replaced it with a brass countersunk screw and nut of suitable size, with the spring from a ball point pen (a useful trick to remember). The steam feed is taken directly to the engine block, with no throttle, reverser or lubricator. The cylinder and piston are of traditional single acting oscillating design; 10mm diameter x 20mm stroke. The con rod big end fits on a crank pin on the flywheel. 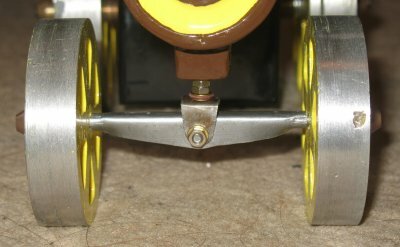 At the other end of the crankshaft is a brass pulley, with a drive band to a groove in the near side rear wheel. In restoring this engine, I have retained the character of a school project; leaving the rough edges and poor castings as they are. I have removed the rust from the steel parts and repainted the engine in similar colours to those on the cover of Kenneth Wells' book. The last photo on the left is taken from the cover of the book. The canopy, as shown on the book cover, is missing and I'm not sure if it originally had one. Most of the examples I've see don't have it. However, the rear firebox panel appears to have holes for the supports, but the holes do not go through into the side panels. As acquired, the burner was missing but I have since acquired a newly made burner from a forum friend. The exhaust pipe was missing and I've replaced that. Unfortunately, it looks a bit odd because it's copper and the original feed pipe is brass. I have replaced some of the original rusty steel nuts and bolts.